A tiny hut on chicken legs? 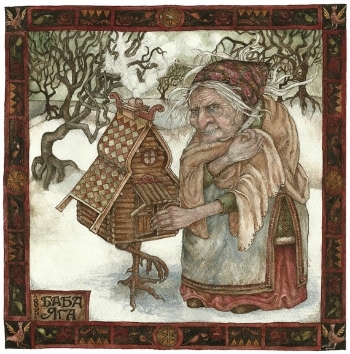 In Russian folklore, Baba Yaga (pronounced ee-ga) is a sorceress who lives in a tiny hut on chicken legs. She lives deep in the forest and whizzes around in a flying pestle and mortar. Sometimes she acts benevolently. More often she roasts children over the fire and has them for supper. Baba Yaga's hut is so small that she can lie on her stove (Russian stoves are encased in huge brick chimneys) and reach any part of her hut without moving. It is for this reason that I occasionally chuckle and remind myself of Baba Yaga. Not because I ever fancy roast children for tea. But the good news is - I'm moving. Imminently! I'll still be at Hillcrest though. I'm only moving a few metres across the yard. I won't be living in a caravan anymore. I won't be living in a house. I'm not going to tell you where I'm going to be living until I get there (some of you know already!) but suffice to say, I'm very excited! Newer PostHow quiet is 'quiet'?